KITsubs: Kamen Rider episode 29! 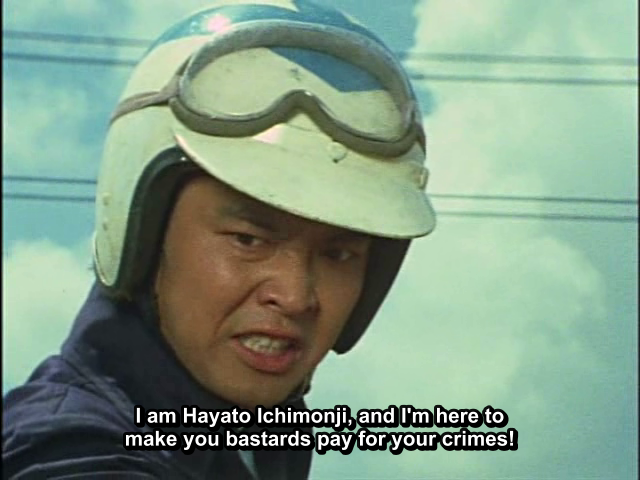 Hayato gets the headline image, but Taki's the one that really shines in this episode. He is a man that walked (and fought) amongst legends, and this episode really shows it. This episode is a little all-over-the-place. There are a few plot points that come up, and never really get mentioned again. And Shocker's plan is kind of vague... But the final battle between Rider 2 and the monster is nice! A lot of really great close quarters fighting. And any Taki-centric episode is A+ in my book! While we're here talking, let me address something about our ddls. If you look back through the archive, you will notice a lot of dead links for episodes. You'll see them spread across the myriad of download services that we've used these past two years, especially in the wake of Megaupload. We do not update these links. Once an episode has been released, we will rarely (if ever) come back to the release post. You should be getting your ddl links from here - our Official Release Page. It's linked on the sidebar, but I wanted to talk more about it here. We've received a few messages on Facebook and Twitter about dead links, and I figured that it might help to inform some of our new fans about this section of the blog. These links are always updated, always up to date, and this is where you should be going to report dead links. Right now everything is hosted on KRDL.info, and they have been a HUGE help to us! You can get the episodes from us, or from their site. Anyway, enough off-topic rambling. We'll be back next week with a surprise release! Also keep an eye out for Stronger 27, coming soon! Kamen Rider Skyrider episode 28!